The most significantly favorite and popular hangout place for the young people of Delhi or especially, the DU students is Majnu ka Tilla. There are many restaurants and eat-outs that are more than famous here. Also, the place is a proud owner of many street shops to embrace the act of street shopping which includes jeans, colorful tees, shoes, flip flops and bags from Rs 300 onwards. Now to enlighten you more on the major highlights of the place, it would be a great honor for us if you read the whole article with great patience. This Tibetan colony of Delhi was colonized around the year 1960. Officially, Majnu ka Tilla is known by the name of New Aruna Nagar Colony and Samyeling. The place is a part of North Delhi district area and is positioned amidst the Yamuna River and Delhi’s Outer Ring Road which is near ISBT Kashmiri Gate. What makes Majnu ka Tilla famous? 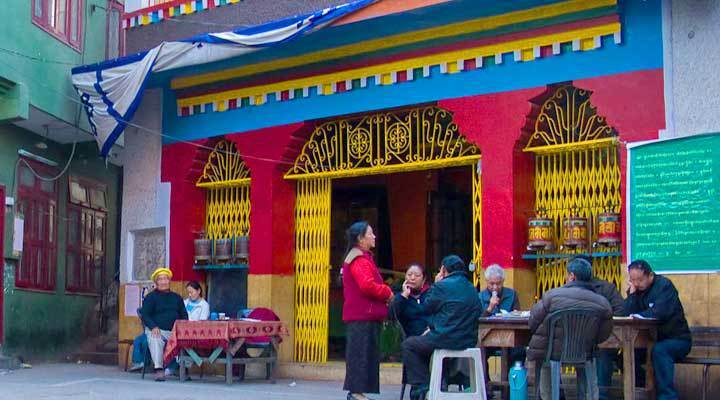 The place is individually famous for Tibetan food and Tibetan market. The name was helmed after a local Iranian Sufi mystic, Abdulla who was nicknamed as Majnu. Being an ardent devotee of Guru Nanak Dev Ji, he carried people over the Yamuna River for free and claiming it as a service to God. The place is famous for street shopping with clothes like jeans, flip-flops, colorful tees etc. also, if you wish, you can even get the posters of Tibetan deities, Tibetan pendants, posters and figures of Dalai Lama, Chinese and Korean movie CDs and DVDs. All these things can be brought at a price ranging between Rs 100 to Rs 500. To attract the female section, the market for this place abundantly has the regular and fake jewelry that can be fetched at a very nominal price. Overall, the Majnu Ka Tilla’s market is a fabulous place to buy for souvenirs, attire, and accessories. The Gurudwara Majnu Ka Tilla Sahib resides on Khyber Pass Road, Outer Ring Road, New Delhi. The first Muslim disciple of Guru Nanak Dev Sahib Ji was Majnu who transformed his khanaqah into a Shrine of Guru Nanak. This shrine is now well known as the Gurudwara Majnu-ka-Tilla. This religious place holds a very significant historical importance as during his visit to Delhi, Guru Hargobind Sahib Ji (1595-1644 A.D.) camped at Majnu Ka Tilla. In the year 1783 A.D. Sikh general, S. Baghel Singh camped here and raised the Sikh flag on Red fort. Not that you think the story ends here for this place, but just begins with another segment of various eat-outs and for the same reasons this place is concluded as the Foodie’s paradise. There are N numbers of options that are available for you in terms of eating. The options are not just famous for momos but also for the authentic Tibetan delicacies. There are many eat-outs that cater variants in Chinese and Tibetan dishes. Now apart from this, the place has its own importance when it comes to meeting friends but the main question that arises here I how to reach Majnu ka Tilla. The best way to reach this place is by communicating via metro and the nearest metro to this place is Vidhan Sabha on Yellow Line, i.e., Jehangirpuri-HUDA line. From the metro station to the final destination, the cheapest way to go is a rickshaw. If you are a student in any college of Delhi University (North Campus) or you stay in Kashmiri Gate / Vidhan Sabha, then a rickshaw can be the best way to commute. Furthermore, one can also get down at Kashmiri Gate or Vishwavidyalya metro stations to reach Majnu Ka Tilla. To get it better, you can understand it like this that Majnu Ka Tilla is simply 1 Km distant from Wajirabad (Outer Ring Road) stop. The place is also the favorite point for shooting as many latest and old movies have been shot here. Recently, the movie Sultan found and gave this place an important scene. So who knows, while visiting someday this place can let you enjoy the opportunity of seeing a shooting or an encounter with one of your favorite stars! In the conclusion, it can only be suggested and concluded that Majnu ka Tilla is not just a place where you can shop, eat and enjoy but also stand a chance to see the much-awaited things of your life.